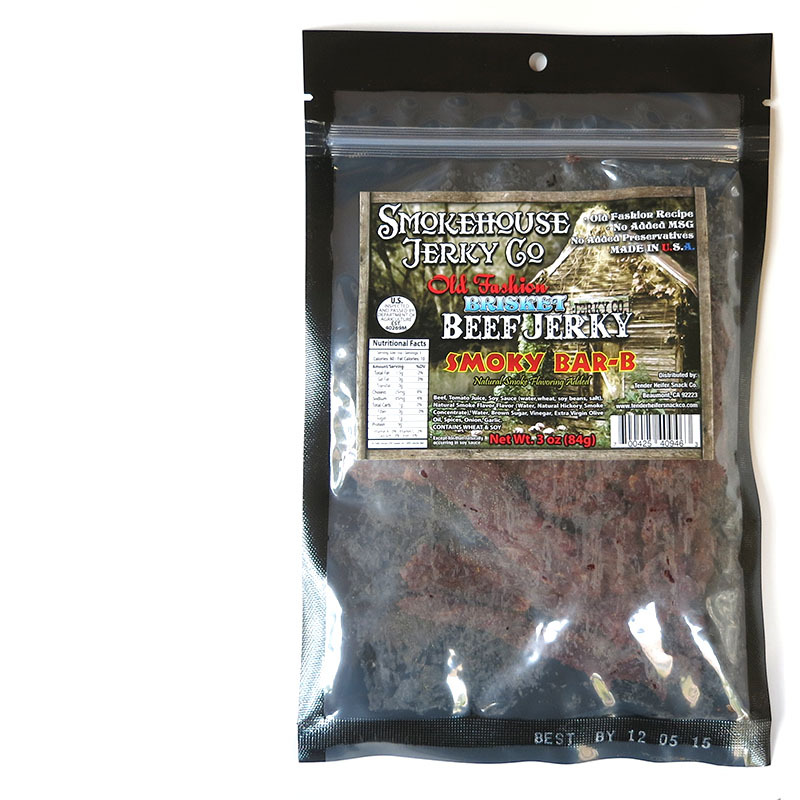 This "Smoky Bar-B" variety is described by Smokehouse Jerky Co as, "Great taste of mesquite smoked meat with no after taste, just great flavor and tenderness." Beef, tomato juice, soy sauce, natural smoke flavor, water, brown sugar, vinegar, extra virgin olive oil, spices, onion, garlic. The first flavors to hit my tongue is a sweetness and a noticeable smokiness, even more than the company's "Ole Cracked Pepper" I reviewed before. The chewing brings on a more defined barbecue sauce flavor, with a tomatoey base, much like a heavily sweet, lightly tangy, St. Louis style BBQ. For being marketed as "Smoky Bar-B", it certainly fits the bill. It has an easily recognized smoky flavor along with a sweet, tangy barbecue sauce. It reminds me of eating actual beef brisket slathered in sweet barbecue sauce. The barbecue sauce is not spicy, but rather mild and suitable for all tolerances. 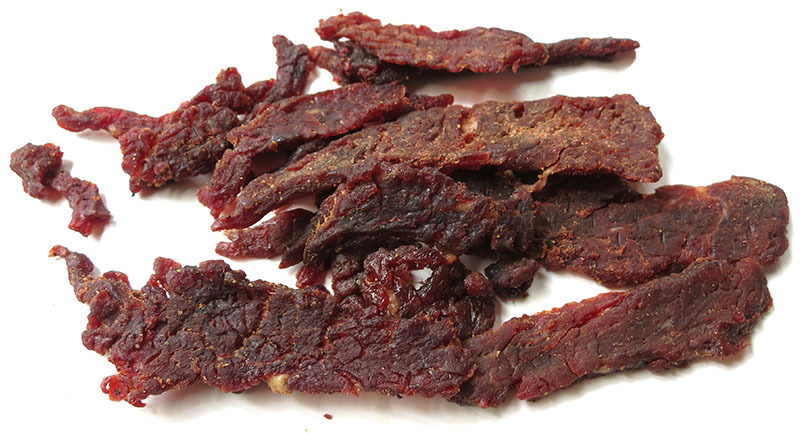 Otherwise, the flavor that defines this jerky is largely the barbecue sauce, mild, heavily sweet, but lightly tangy. There are some natural meat flavors that I can detect, but not as easily recognized as with the company's "Ole Cracked Pepper". 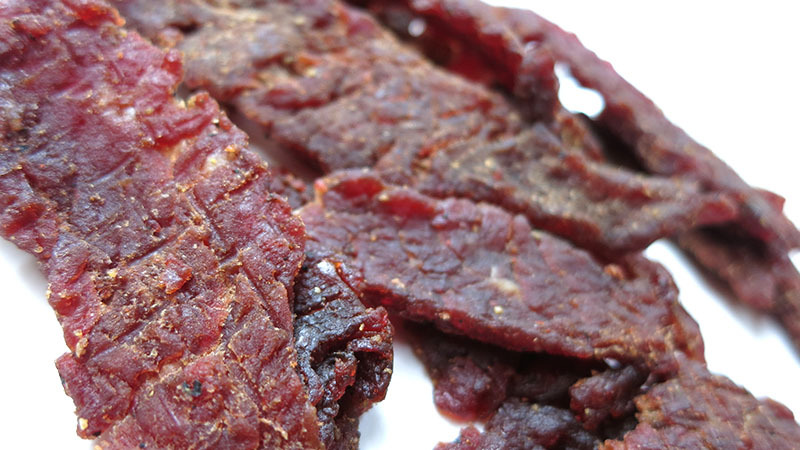 The meat consistency is classic brisket-style jerky. It has the usual stringiness, but not as bad I've found in other brands. The chewing is easy, and seems a little more tender than the Ole Cracked Pepper variety. It has a meaty feel, and tends to have a steak-like texture. Verdict: This Smoky Bar-B from Smokehouse Jerky Co does a good job of recreating that smoky, grilled barbecue beef brisket flavor. You get a little more smokiness in this than the company's other jerky varieties. The heavier sweetness does add some sticky handling, but not too bad. Otherwise, I found it very addicting.